By appointment, 7 days a week. As we are a boutique family winery and we wear a lot of hats, we appreciate your call ahead of time to provide you the very best tasting and tour experience. Cheers! Our dream was to create high quality, hand crafted, small lots of cabernet sauvignon from top Napa Valley appellations. In vintage 2000, we made our first barrels from merlot grown on the Carneros property where we lived. We knew we were on to something special! For several more years, while working a full time job in the wine industry, James spent evenings and weekends learning the intricacies of winemaking. James was fortunate to have the opportunity to work alongside two phenomenal winemakers in the Valley; Mark Jessup, former winemaker from Jessup Cellars, Robert Mondavi and Opus One and now winemaker at J. Gregory Wines, and subsequently with Gustavo Brambila, former winemaker for Chateau Montelena, Grgich Hills and now part owner/winemaker of Gustavo Wines. Dreams do come true but not before a lot of hard work! In 2010 we opened our own winery located in the southernmost part of Napa located in the Wine Crusher District, Napa's boutique artisan winemaking district. To support our growing dreams and cellar, we invited rising star consulting winemaker, Julie Hagler Lumgair, to join our team after working with her on our first Russian River Valley 2010 Chardonnay, then expanded again to support our full winemaking range and new vineyard sourcing in vintage 2012. Our name on every bottle is a promise of the highest quality. Everything is crafted by hand, then patiently vinified in separate single vineyard blocks and barrel lots in limited quantities, with production steadily increasing each year. Our passion is to produce not just good, but great wines that reflect their vintages and single vineyards from top appellations in the Napa Valley. 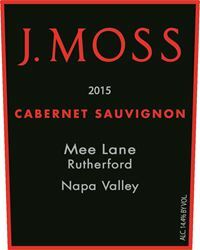 We hope each wine will provide a unique and rewarding experience and will show you the amount of care that goes into each bottle of J. Moss wine. We invite you to share our family's passion for fine wines and the tradition of making memorable cabernets in the Napa Valley! Come and visit us and share the dream on your next trip to the Napa Valley! Thank you for your interest in visiting J. Moss Winery. We are delighted to welcome you for a private tasting of our limited production single vineyard wines from some of Napa Valley's top AVA's. Our winery is located in the southern part of Napa, approximately 5 min. south of the City of Napa in the Crusher Wine District. Tastings are by appointment only. We can accommodate up to ten (10) guests. Guests must be 21 years of age or older. Following a winery tour, tastings will be conducted in a seated guided tasting with someone from the Moss family. Wine Society members and up to 3 guests are complimentary. To join the wine club, visit www.jmosswines.com or call 707-647-3388. 15% discount on 1-3 bottles for Napa Neighbors and guests with them at the time. Tasting fees refunded on 3+ bottle purchase. 25% "Club for a day" Napa Neighbor discount for 1+ case on day of visit.